Common signs include sluggish response in vehicle handling and rattling or squeaking noises from underneath the car. One of the most under-appreciated yet incredibly important mechanical components hiding underneath our vehicles is the stabilizer bar bushings. Located on the undercarriage of your vehicle and engineered to reduce road noise, absorb bumps and cracks in roads and deliver a softer ride, the stabilizer bar is supported with rubber bushings that keep the vehicle's body from rolling as it navigates turns. 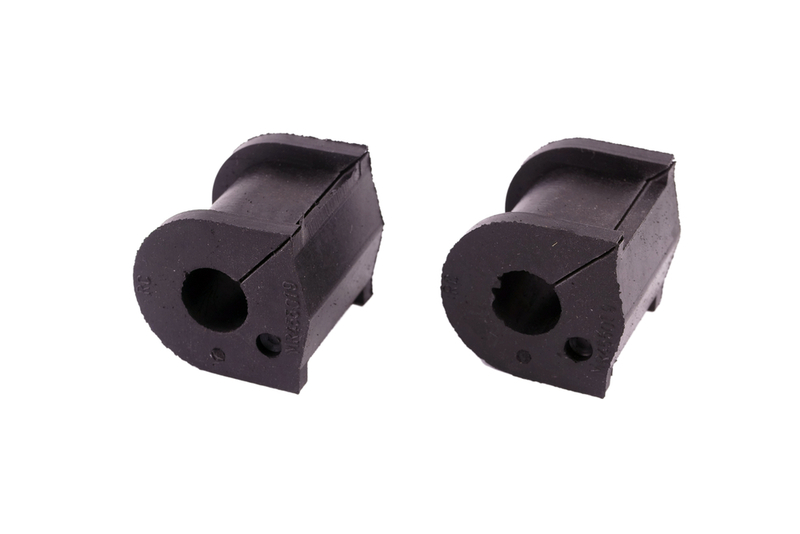 When they are properly lubricated and maintained, the stabilizer bar bushings can deliver optimal driving conditions for years. However, when they start to wear out, the warning signs can range from subtle noises to significant problems with steering and handling; potentially leading to vehicle accidents and other safety concerns. The information below will help you self-diagnose if a potential problem with your stabilizer bar bearings exists, so you can contact a professional mechanic to inspect, diagnose and repair the problem before it causes additional issues with your vehicle. Since you drive your car every day, it's probable that you have a clear understanding of how your car handles the road. One of the easiest ways of diagnosing a problem with the stabilizer bar bushings is when the handling seems sluggish or slow to respond; especially when you make quick turns in your vehicle. Additionally, if you turn into a corner and the vehicle seems less stable than it has been previously, this is also an indication of bushings being worn and needing to be replaced. The important thing to remember is that when the stabilizer bar bushings begin to wear out, they do so quickly. By ignoring the warning signs, it could lead to a potentially dangerous situation, causing you to lose control of the vehicle under what would typically be a normal driving situation. Anytime you notice a difference in the way your vehicle is handling; contact a professional mechanic to inspect the stabilizer bar bushings and replace them as needed. The stabilizer bar is located directly under your car. When the bushings become torn, worn out or completely break, the stabilizer bar itself will become unstable and cause a rattling or clunking sound while you are driving. The noise will get progressively louder when you steer the car in either direction or when you are driving on a rough road. Typically the noise will come from the front of your vehicle, near your feet on the floor board and are very noticeable. When you hear clunking noises coming from this location, drive safely home and contact YourMechanic so they can inspect the stabilizer bar and if needed, replace the stabilizer bar bushings. Different than a rattle or clunking sound, the squeaking noise coming from under your car is a potential warning sign that the bushings are starting to wear. This sound is noticeable while you are driving over bumps, making aggressive turns to the left or right, or if you drive into a driveway. This noise is typically caused by a stabilizer bar bushing that is not properly lubricated due to metal-on-metal contact. If caught early enough, YourMechanic can clean and properly lubricate the bushings with a grease gun to avoid additional damage being done. Regardless, if you hear this sound coming from the area near your feet when you drive; it's never a good thing. Have it checked out by a mechanic as soon as possible. As tempting as it might be for a novice to work on their car, the stabilizer bar and specifically, the stabilizer bar bushings are delicate mechanical parts that should only be serviced by an ASE Certified mechanic. This is primarily due to the fact that in order to correctly service these parts, specialized tools are required to be used. The removal and assembly process involved with stabilizer bar replacement is also complex and must be followed precisely in order to reduce the potential of complete parts failure and potentially dangerous situations. Take time to listen to your vehicle, as it will let you know when critical parts like the stabilizer bar bushing are starting to wear and need to be replaced by a professional mechanic. Q: My brakes on my Jeep are squeaking after I replaced them?